Decorate your desk with a digital creeper, which is tweeting in its own way! The BitPlant decomposes Twitter messages in their individual bytes and bits to generate delicate minimal experimental sounds. Install the small and free BitPlant app. Log in to your Twitter account and your BitPlant connected via USB is already active! The branches of a flat ribbon cable forms with their branches the plant-like structure, which gives the BitPlant its very own character. At the cable ends are each electronic components are carefully soldered, which reminds of leaves, flowers or insects. 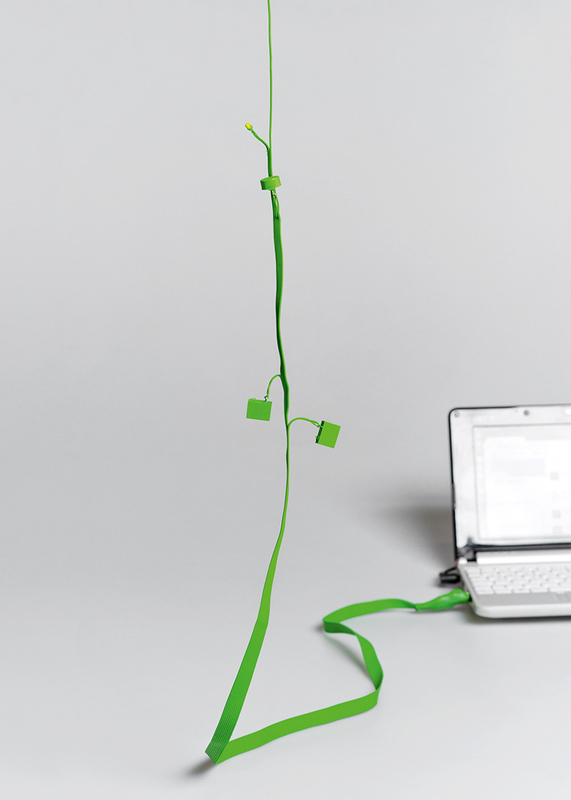 With the USB plug at the lower end of the cable the abstract plant is brought to life. Every new tweet will be converted into sounds by the BitPlant using discreet click and humming sounds. The minimalist gadget generates a sensitive digital soundscape from your personal stream of short messages.